Artists of old were patroned by investors in culture to see the world around them changed. We invite you to partner with us to reach people with the beauty of the gospel of Jesus of Nazareth. Consistent financial patronage by ministry partners is the source of income that supports our ministry with Cru. If you would like to join our team of patrons today, there are 3 ways you can give. How close are we to being fully-funded? Since joining the staff of Cru, we have seen God provide for our needs through the consistent financial support of a team of ministry partners. We are so thankful for those God has brought alongside us in ministry in prayer and finances. 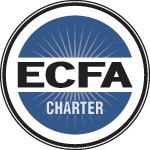 As a charter member of the Evangelical Council for Financial Accountability, Cru is consistently rated by Forbes Magazine as one of the top 3 religious non-profits for use of funds. *Each missionary with Cru, including our president, Dr. Steve Douglass, is responsible for raising 100% of their personal and ministry expenses. Cru does not have a central fund to pay the salaries of their missionaries. When someone joins our team as a ministry partner their financial gifts go into our staff account, rather than a general fund. Out of that Cru staff account, we are able to draw our salary which pays our living, as well as ministry expenses like resources and materials that we give to students and professionals and travel for conferences and events.